The heparin tubes are use to blood sampling in clinical biochestry, emergency care biochemical and hemorrheological tests. 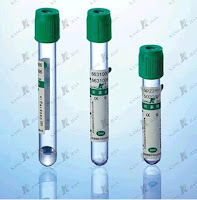 - Maximum Centrifuge Speed: 5000 turns/min. 1. Soon after the sampling, turn the tube 180°upside down,shaking and mixing 5-6 times. the calcium due to the relative higher content of the heparin. otherwise, the blood will coagulate again..